Pat Fitzsimons of LaQuinta, CA and Dan Hill of Broadmoor Golf Club in Seattle, WA will be formally inducted into the Pacific Northwest Section PGA Hall of Fame on April 26 during the Pacific Northwest Golf Hall of Fame induction ceremony at Inglewood GC. Pat Fitzsimons has a distinguished playing record that includes winning the Northwest Open (three times), the Pacific Northwest PGA Professional Championship (three times), the Oregon Open (twice) and the Al C. Giusti Memorial (twice). These titles span 27 years of consistently impressive play. Only three Northwest professionals hold more titles and they are all Hall of Fame members. Fitzsimons played on two Hudson Cup teams as an amateur, 10 as a professional and four as a senior professional. His record in the professional matches is an impressive 20-4-4. He was the PGA Tour’s 1975 Glen Campbell Los Angeles Open champion and played in two Masters. 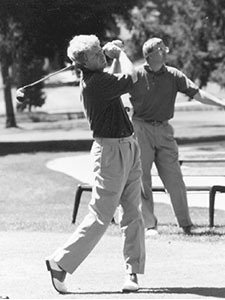 Fitzsimons served as the Head Professional at Prineville CC, The Oregon Golf Club and The Cedars on Salmon Creek. A renowned teacher, he taught students at Salem Golf Club and was an instructor to his fellow professionals at PGA Teaching Workshops. 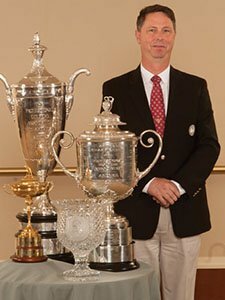 Dan Hill, Director of Golf and Operations at Broadmoor Golf Club, has a career of unparalleled service to his fellow professionals. He served 13 consecutive years in PGA governance, highlighted by his role as President of the Pacific Northwest Section PGA from 2009-2010. Hill’s duties moved to the National level from 2014-2016, when he served on the PGA of America’s National Board of Directors. A passionate advocate of education throughout his entire career, he has led education committees at the chapter, section and national level, including serving as Chair of the National Education Committee. Hill has achieved the PGA’s highest certification level in becoming a PGA Master Professional. Honored by his peers, he was the 2010 Pacific Northwest Section Golf Professional of the Year and a six-time Pacific Northwest Section Merchandiser of the Year. Hill’s career includes employment at Wing Point Golf and Country Club and Hayden Lake Country Club, between three postings at Broadmoor Golf Club. The Pacific Northwest Section PGA established a Hall of Fame in 1981, and it currently has 54 members. Fitzsimons and Hill will become the 55th and 56th members at the Pacific Northwest Golf Hall of Fame induction ceremony on April 26 at Inglewood GC.